A trio of top results at Brands Hatch on Sunday helped lift Jason O’Halloran up to fifth in the final MCE British Superbike Championship standings. 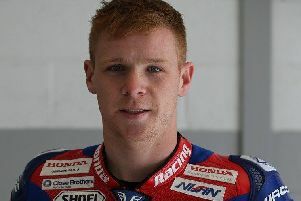 The Australian rider who lives in Market Rasen was hoping for a good weekend to end his season and went well on the Honda Racing Fireblade to take a sixth, fifth and then a second place at the final round. Starting the first of three races from a second row grid position, O’Halloran got away well to settle into fifth place, but the race was red-flagged for a multiple crash on lap three and he had it all to do again. At the restart he was sixth on the first lap, but was pushed back to seventh when overtaken by James Ellison. But he regained sixth place when Michael Laverty went out on lap four and maintained the position throughout the remainder of the laps to pick up 10 championship points. After starting race two on Sunday from row three, he settled into seventh place and was mixing it within a group of seven riders exchanging places for the first half of the race. O’Halloran hauled himself up to fifth and held off moves to keep the position for 11 more championship points. He began the final race of the season from the second row and was running in sixth when the safety car came out after series leader Leon Haslam crashed heavily. Once the car left the track, O’Halloran took the opportunity to pass Shane Byrne who would go on to clinch the title. He then passed Christian Iddon on lap 12 and after the pair exchanged places over the next few laps he finally shook Iddon off to secure fourth position. One lap later he passed Michael Laverty and then James Ellison to find himself in second place with two laps left. He closed the gap to leader Josh Brookes, but was unable to get near enough to make a pass and had to settle for second place at the chequered flag. O’Halloran said: “I felt really strong. I had to make some hard passes to get to Josh and I was trying so hard to get the win in that race and it would have been fantastic to get it, but second was the best we could do. “I was at the absolute limit and had nothing left so had to settle for second. O’Halloran completes his campaign in the same position as last year and scored 567 points, just one less than last year.